Batman's director, Zach Snyder, has put the rumors to rest. 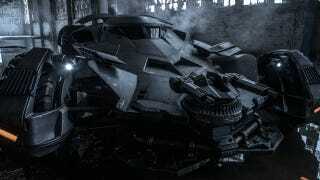 This is the new Batmobile, and that sound you hear is the simultaneous bowel evacuation of the villains of Gotham. After a suspicious pic surfaced yesterday, Snyder decided to dispatch with the speculation and tweet out this full-frontal shot. The gun turret dominates the front end, but check the high-res shot below and you can start to see the insane level of detail the production team has put into the Bat Man's new ride. It's got wings and flaps and armor plating and missile launchers and are those in-board shocks? Who cares. It's all awesome. And it probably looks even better at speed. Batman vs Superman can't come soon enough.